Team Aluminos driver coach Tom Dyer jumped back into the seat to score his second S3 feature win of the season (Photo: Tony Leone - sixspeedphotos.com)Wrapping up the final round of the ProKart Challenge North program, the Team Aluminos squad returned to the Jim Russell International Karting Center in search of final victories. 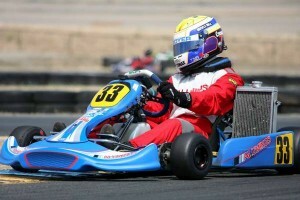 Closing out the 2009 PKC regular season, which has seen the Northern California based operation accumulate multiple race wins, podium finishes, as well as a class championship while competing in the PKC North and South series. At the North finale, six drivers flew the Aluminos colors with led by Aluminos driver coach Tom Dyer climbing back behind the wheel in preparation for the SKUSA SuperNationals in November. Dyer started off the weekend as the driver to beat, posting the quick lap during the timed qualifying session to earn the pole position by nearly four tenths of a second for the opening heat. Dyer’s run at the front was short lived as contact from behind in the initial lap of the first heat sent him off track and out of the contest unable to continue with a damaged kart. Excellent and quick repair work by the Aluminos team helped Dyer to pick up where he left off in qualifying as he had to start from the tail of the sixteen kart field in heat two as a result of the heat one DNF. Dyer, posting the fast lap of the race, carved his way forward to end up fifth in the eight lap stint. Starting fifth for the final, Dyer got a great jump at the drop of the green flag. Coming around for the first lap, Dyer found himself in the lead and pacing the field. Pressured by fellow GP driver and defending class champion Jason Toft, the two swapped the lead on several occasions until Dyer locked in the position on lap 17, edging out his opponent to the line by 0.177-seconds for his second victory of the season, while showing the way with the fastest lap of the race. Jeff Smith earned his first career championship in the S4 divisionAs the 2009 season comes to a close, the Team Aluminos drivers and staff are steering toward ending the year on top. With the final round of the ProKart Challenge South taking place August 29 at the CalSpeed Karting facility in Fontana, California, the first of three events to wrap up the season is in the books with Aluminos coming out as a champion. With a full tent of seven drivers, team manager Rob Soares and the staff of George Tavares, Tom Dyer and Fritz Leesmann were kept busy throughout the event with the tough circuit and fierce competition in attendance. 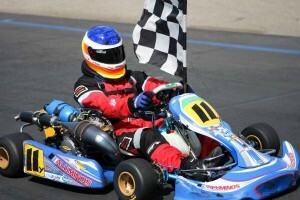 Championship hopes rode on the shoulders of S4 driver Jeff Smith. With a consistent string of results, Smith entered the event as the championship leader and a recent feature winner. Smith kicked the event off on the right foot, literally, as he just grabbed the pole award by a mere 24-thousandths of a second. That slipped away at the start of the first heat race as Smith fell back to third in the opening lap. With grit and determination, Smith managed to reclaim the top spot for the heat win. Getting off the line better to begin the second heat, Smith led all 10-laps for the win, placing him on the pole for the main event. From there, Smith was able to stretch out for solid victory to clinch the S4 championship. Kiwi driver Daniel Bray powered his way to his first PKC North S3 victory aboard an Aluminos-prepared packageFor the second straight Superkarts! 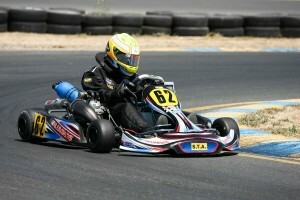 USA ProKart Challenge North event, Team Aluminos took the top step of the podium following the action during the sixth round on August 15 at the Jim Russell International Karting Center in Sonoma, California. With team manager Rob Soares overseeing the Team Aluminos activities throughout the weekend with help from national driver Fritz Leesmann and team engine specialist George Tavares, the four drivers contesting the event were in good hands. 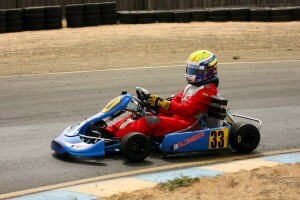 Three drivers flew the Aluminos colors in the S3 division, led by New Zealander Daniel Bray. The Kiwi driver has been competing in the United States all season and switched to the wildly popular and successful stock moto division at round two of the PKC North program. Bray clocked in the second best lap time during qualifying, missing out on the pole position by just 0.069-seconds. Steve Reasoner and Brad Dunford joined Bray in the class, posting the fifth and sixth quick laps of the session. Team Aluminos Driver Coach Tom Dyer swept the S3 division in preparation for the upcoming SKUSA SuperNationalsAs the year progresses, any driver, mechanic, or team strives to improve reaching a point where all the pieces of the puzzle link together and positive progression is achieved with each continuing race. Motorsports is an amazingly dynamic environment that challenges it’s participants with a multitude of ever changing factors keeping everyone on their toes as they strive for victory or personal bests. It’s these results in the heat of competition that are the key indicators of progress as to how well the hard work and dedication that is being put forth is on the right track or not. For Team Aluminos, as they enter the home stretch of the ProKart North and South regional season, its team performance at the recent ProKart Challenge North race was stepped up as the progression of the year builds toward the championships and eventually the SKUSA SuperNationals.